Cougars are a large carnivorous cat found predominately in the Americas. 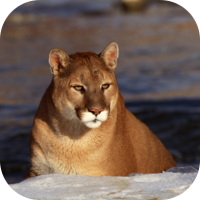 Habitat: Cougars are found in western Canada, western United States and Florida, Central America, and South America. 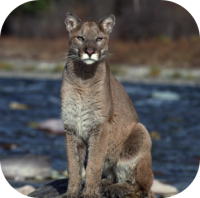 Cougars are found in forests, swamps, and grasslands. Cougars are also found in Asia and Africa. Size: Cougars are the fourth biggest feline in the world behind the lion, tiger and jaguar. Male cougars are larger than their female counterparts. 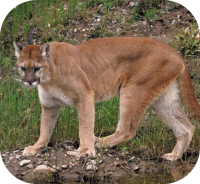 Male cougars measure 4-6 feet in length and weigh 147 to 227 lbs. Female cougars measure 3-5 feet in length and weigh 79 to 132 lbs. 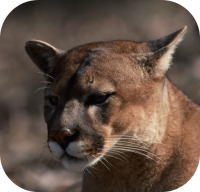 Cougars stand 1.9 to 2.3 feet at the shoulder. 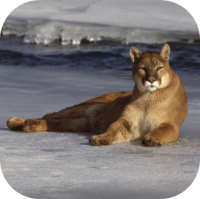 Diet: Cougars are carnivores they eat deer, elk, beavers, pigs, capybaras, raccoons, armadillos, hares, and squirrels or other mammals in their habitat. Cougars are "ambush" hunters usually over taking their prey. Description: Cougars are powerfully built, with large paws, sharp retractable claws. Behavior: Cougars will mark their territories with feces, urine, scratched logs. Males cougars will have home ranges that may cover as much as 100 square miles. Their ranges will often overlap with other cats. Birth: Cougars give birth to 1-6 cubs, but it is more common for them to have litters of 3-4. 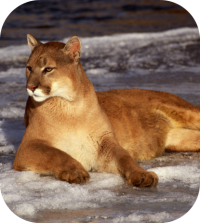 Cougars are the largest cats that can purr! Gestation: Cougars carry their young for 3 months. Cubs: Cougar cubs are 8-15 ounces at birth. 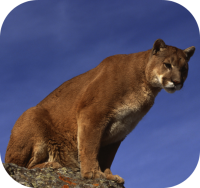 The geographic range of cougars in Americas is larger than that of any other animal. Sexual Maturity: Cougars are sexually mature between the ages of 2-3 years of age. Life Span: Cougars live up to 20 years of age in the wild. Social Structure: Cougars are solitary except during mating season and when a mother has cubs. Athleticism: Cougars are extremely agile they can jump 18 feetfrom the ground into a tree. Cougars can run up to 40 mph.